As they continue to fight the spread of misinformation on their platform, Facebook has now expanded their fact-checking system to also review photos and videos in addition to written content. Using a “machine learning model,” photos and videos will now be reviewed to determine if they contain “potentially false content” and are manipulated or fabricated, out of context, or are a text or audio claim. You can learn more about Facebook Pixel here! Four months ago, Facebook announced their plan to launch a dating app, and now they’ve begun testing their new dating feature in Colombia. According to The Verge, Facebook’s dating profiles will include a mix of photos and answers to prompted questions, and will allow users to browse matches within 62 miles of their phone’s GPS location. But don’t worry about any awkward encounters with your friends—Facebook friends will reportedly be excluded from matches, which take location, shared page likes, profile similarities, and mutual friends into consideration. The feature is only being tested on mobile right now, and it is free to use (and ad-free) for users over 18 who opt in. LinkedIn launched their new LinkedIn Groups this month, which they’ve “rebuilt from the ground up,” according to their official blog. Now you can post original videos, multiple images, and other rich embedded media within the groups, which are available on the main LinkedIn website and the app. and. Soon you’ll be able to quickly find and access your groups through a navigation panel on your home page and discover recommended groups to join in the ‘My Network’ tab on desktop. For all you Outlook users out there: LinkedIn and Microsoft have teamed up to integrate LinkedIn with Office 365. Now when you connect your LinkedIn and Office 365 accounts, others will be able to see your LinkedIn profile information under your profile card in Office 365. LinkedIn will also add insights about the people you’re scheduled to meet with on the Outlook Calendar by pulling information from LinkedIn. From the words of LinkedIn’s official blog, the goal is to “make your meetings more effective and personal.” You’ll also be able to send emails to your LinkedIn 1st-degree connections through Office 365 and coauthor content in Word, PowerPoint, or Excel without needing their email address. In Talent Insights, you can see where talent is located, what skills they have, and who’s employing them. You can also use the Company Report feature to find out which roles and skills are growing quickly at your company and competitors’ companies. Learn more about Talent Insights here! As of now, there’s no word on what’s next for Instagram moving forward. Instagram expanded its shopping features this month, now allowing brands to link to products not only in their posts, but also in their Instagram Stories. Users can tap on products they see in Stories to learn more about the items, and they can browse a new shopping channel in the Explore tab, which features brands they follow and might like. Rumour has it that Instagram is also working on creating a standalone shopping app—but the question is, would you use it? Instagram has also been busy testing some new features that could be coming to your feed in the near future. Among the features being tested is the ability to re-share posts from other accounts, and the ability to tag friends in video posts. As for a new feature that has already rolled out, you can now send GIFs in direct messages on Instagram, using the new GIF button that lets you select images from GIPHY’s library. Now direct messaging is just a little more fun! Reverse chronological order timelines are back! After changing their timeline to use an algorithm that shows relevant tweets first, with features like “in case you missed it” and recommended tweets, Twitter is now allowing users to revert their timeline back to reverse chronological order and view tweets by recency. To activate this setting, go to settings and uncheck the “show the best tweets first” option. A fresh new look is in the cards for Twitter, as they’re currently testing a new website design.The new version will offer bookmarks, the explore tab, and a new ‘data-saver’ mode to its desktop website, while embodying more of a minimalist look. As for other potential upcoming changes, Twitter is testing out threaded replies to make tweets more “conversational,” along with testing status indicators to show when you’re online. No word yet on whether these features will be officially launched in the future. That’s it for now! We’ll be back next month with more social media updates. 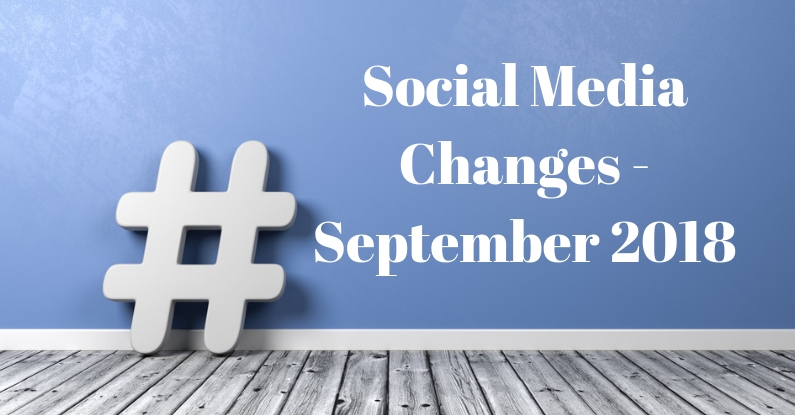 In the meantime, you can find our full social media changes report for September 2018 on AdvisorU.